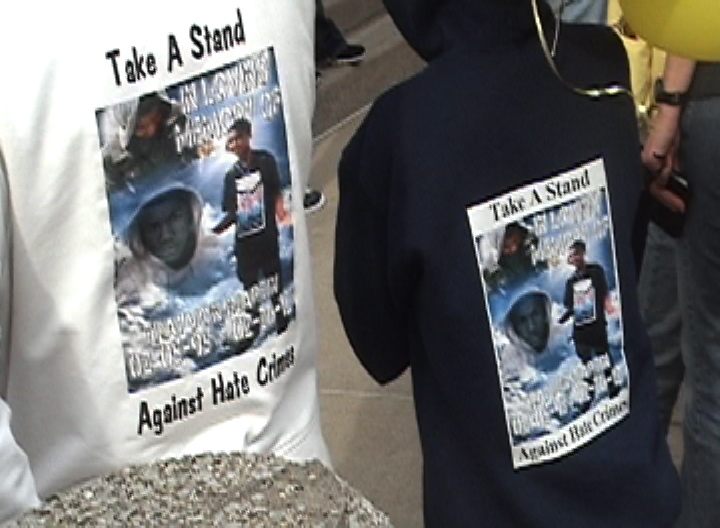 Yesterday, about 50 people marched in downtown Grand Rapids to denounce the murder of Trayvon Martin and to stand in solidarity with his family and all those who have been recent victims of racist violence. People gathered at a small storefront space, which is home to Take Hold Church. The two women responsible for organizing the march then addressed the crowd. Sheri Munsell spoke first and talked about how the murder of Trayvon impacted her emotionally. She said she kept thinking that Trayvon looked just like her nephew all grown up and it made her fear for his future. Sheri then went on to say that Trayvon’s murder should be a wake up call to all of us to not stand by in the future and let this kind of violence happen to our brothers and sisters. She said we needed to stop the so-called justice system from profiling and abusing communities of color. Sheri also acknowledged that Trayvon’s murder was just the most recent in a long list of people, primarily young black men, who have been shot or beaten to death by police officers around the country. This is a theme that many writers and organizations have been communicating in recent weeks. Sheri was followed by April Bert, who began her comments by quoting the poet Maya Angelo. April said that Trayvon represents so many who have been victims of a racist system of oppression, but he also represents the past, the present and the future of what we want to be. 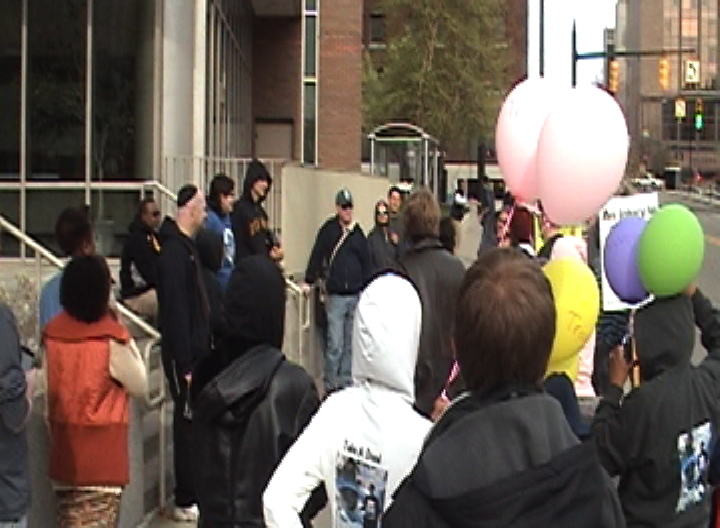 Once the group arrived at the Kent County Court House, Rev. Paul Mayhue said a prayer and then continued to address the crowd. Mayhue acknowledged that there was a great deal of injustice happening in the US, but he put the emphasis of his comments on the importance of working within the system. Mayhue challenged those in the crowd to run for political office and judicial seats so that they could make the right decisions when faced with racist and violent actions in our community. 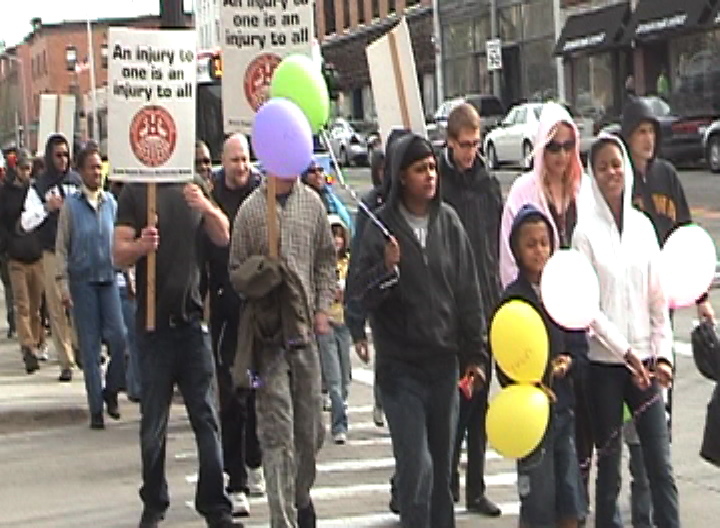 In light of what has been happening with violence against communities of color and the lack of any real justice, Mayhue’s comments seem to contradict what had been said by Sheri Munsell before the march even started. Cole Dorsey, with the IWW, followed up those comments by saying that he was not only encouraged by the fact that people came out for the march, but that it was grassroots organizing and mobilizing of people that can make real change and create real justice. “When we organize together, we can challenge the system,” said Dorsey. He also mentioned that the Prison Industrial Complex disproportionately targets and punishes communities of color, which should tell us something about how the system is corrupt and that we shouldn’t wait for elected officials to make the changes that we want. The last person to address those who marched was Rev. Fred Wooden, pastor at Fountain St. Church. Rev. Wooden framed his comments within the theme of the Jewish Passover and made three points. First, he said that we all need to be willing to move when injustice confronts us, but he also acknowledged that this kind of change would require a cost to all of us. Second, he said that we should not be deceived by those who wish to control us and that we should expect that deception will occur. Lastly, he said that need to challenge those if power, which means we need to challenge the system if we want real liberation. The group than walked back to where the march started, with lively conversation and a second opportunity to communicate to those walking or driving by that indeed there were some people in this community who were not going to remain silent about the murder of Trayvon Martin.